Fully supported by the HUNT ENGINEERING API software for Windows XP/2000 and Linux. The HEPC9 is a full-length desktop PCI plug in card that has four 3.3V 100Mhz HERON module sites. This allows almost any combination of modules to be chosen from the HERON range of processing and I/O nodes. 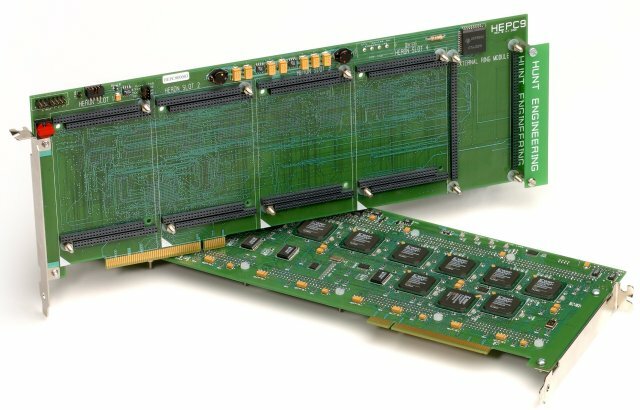 The HEPC9 uses the HEART communications system developed by HUNT ENGINEERING specifically to allow software configuration of Virtual FIFO connections between the modules. It has been specifically designed for real time systems  that is systems where a guaranteed bandwidth is available. Each of the modules has 6 input FIFO connections, and another 6 output FIFO connections that can be routed by configuration software to modules on this or other HEART based boards. The PCI bus node, and the inter-board fifth (non-HERON) module have a connection to the HEART system that is identical to the HERON modules, so they also have 6 input FIFOs and 6 output FIFOs. The HEPC9 enjoys full support of the HUNT ENGINEERING API software, which provides a consistent software interface to all HUNT ENGINEERING host boards, from all supported HOST operating systems.